The story at the turn of the twentieth century in western Pennsylvania was about the steel industry and the advent of the automobile. Harry Weeter left the farm and headed to Pittsburgh to become a machinist. A sliver of steel blinded his right eye in a mill lathe accident. The automobile was changing America and Harry began selling Cadillacs. We have some letters that he wrote to a Miss Margaret Snow who was born in 1897. Harry and Marge Snow soon were married and made their home in Butler. He would go to the Detroit factory on the train and take delivery on a new vehicle to drive home. He would often stay a day or two at a home or farm to teach the proud purchasers how to drive their new car These folks experienced more than a few nervous moments operating the controls of a gasoline motor car. We were told that many of these anxious sessions would begin out on an open pasture.. Harry's perseverance gave rise to a successful automobile dealership that he operated through the roaring twenties and the depression years of the thirties. Studebakers and Pontiacs were sold and serviced at his Butler dealership. 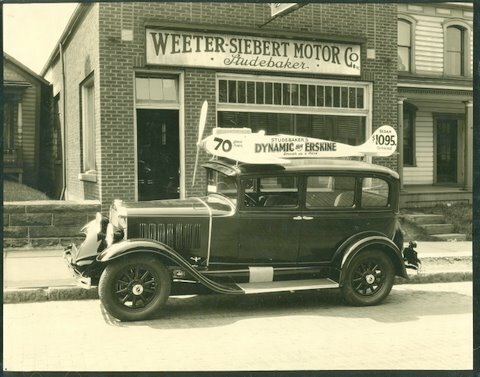 Studebaker was a company famous for horse drawn wooden wheeled wagons and carriages built during the 1800's. They built dependable automobiles and, perhaps, were a subconscious tie back to those familiar Studebaker wagons for Harry.